The MTA can't even properly fix the existing system. I mean, yeah. The Sea Beach rehab is equivalent to fixing a rusted wall by covering it with stickers. Want to know how the Sea Beach stations should look? Check out Parkside Avenue. Same exact platform and canopy design, but rehabbed by the just 20 years earlier. The only areas where they seem to be doing a good job are the station houses, stairs, 8th Avenue, and the northbound platform at Ft. Hamilton Parkway. Before we get all worked up about Amazon let's see what type of working conditions and living conditions this entails. I'm thinking that Interested Rider has the right take on what's going to happen. Varied working hours and more people traveling from the east rather than an exclusive 5 borough commute. Eastern Queens and Nassau would be my guess. I've traveled through/past Arlington, VA and LIC during rush hours quite frequently over the past three years and I doubt the subways or DC Metro will be high on the list of travel options. LIRR before the subway. My thoughts. As for the other contenders maybe those locales weren't willing to give up the financial incentives the " winners" were willing to go with. I read somewhere that the Amazon move to LIC won't cost the company anything in the long run. Carry on. I would expect a big building boom in Williamsburg and Greenpoint. The G could be lengthened to 10 cars if needed. What seems to be missing here is the impact upon bus service and it looks like LaGuardia depot will need to add a lot more runs on the Q103 (Vernon Boulevard),, Q67 (21st Street and 69th Street) and Q/39 (Queens Plaza - Ridgewood 23rd Street) which serve the area. Sunnyside, Woodside and Maspeth will become the go to neighborhoods as these areas are within a reasonable distance from the headquarters, Sunnyside is fast becoming unaffordable and a 20 minute trip on the Q39 will now add northern Ridgewood (near Metropolitan and Forest) along with the straight run along 48th Avenue from Van Dam Street to 48th Street. The Q/67 along 69th Street is also in play especially since the route operates on 21 Street. Varied working hours and more people traveling from the east rather than an exclusive 5 borough commute. Eastern Queens and Nassau would be my guess. You have a point with staggered commute times. Let's remember on the RFP from Amazon Transportation was a must. The Subway is what got LIC and New York picked. Hudson Yard, MurryHill, Greenpoint, Sunnyside, Astoria even Jackson Heights are going to be major points for Amazon Workers. There's going to be a good amount of reverse commutes from Manhattan on and from the South on the . Having worked for a major tech company in the valley You'd be shocked how many people don't have a license Nassau I don't see to much possibility for the upper rank and file older and with families. Coders/Engineers they want the nightlife and everything that comes with living in NYC trust me lol. I disagree. The Amazon demographic seems to be much more the white or asian millennial yuppie type, or the sorts of people who don't exactly dream of suburban (LI) living. If anything, this may help buoy the Williamsburg/Bushwick housing market during the shutdown. Point being, I think the load will absolutely fall on the subway, but much as you do, I really don't see 25k new riders being at all an issue. They said somewhere on TV that the reported average salary of an Amazon worker would be $125,000. Given that the demographic you mentioned, I would imagine they'll want to live close to work with the subway or within walking distance, so either Williamsburg, Bushwick, LIC, Astoria or those areas seem likely, since they'll be able to afford the high rents. You may be correct in your assessment but but I was thinking about the folks around Bell Blvd and further east of the Cross Island. My bigger beef is that some people assume that this amazing amount of new ridership is being dumped on the subway system. I'm not sure if that's the real case. Looking back on my experiences many, if not most, of those new Amazon employees are already employed by other companies in the area and don't really constitute new but rather relocated people using the transit system. If, however, we are including young people who have family plans for the future education and school districts become part of the equation too. Us old folks look at the big picture so forgive me for bringing it up. As far as the projected growth in employment remember that I grew up in the Vietnam era so I'm skeptical about any government numbers, lol. Carry on. I'm not sure if that's the real case. Looking back on my experiences many, if not most, of those new Amazon employees are already employed by other companies in the area and don't really constitute new but rather relocated people using the transit system. If, however, we are including young people who have family plans for the future education and school districts become part of the equation too. Us old folks look at the big picture so forgive me for bringing it up. As far as the projected growth in employment remember that I grew up in the Vietnam era so I'm skeptical about any government numbers, lol. Carry on. I think this is the really salient point here. It isn't like the ~20 million residents of the tri-state area are unqualified to work at Amazon; I'd in fact be surprised if anything more than the top staff is imported. We are home to Columbia, NYU, Rutgers, etc after all... There also seems to be a misconception about the timeline for this plan. It isn't as if we're gonna wake up one morning with 25,000 people suddenly trying to get to LIC. Amazon is promising 25k new jobs over ten years, or an average rate of 2,500 new jobs a year. To put that stat in context, the NYC economy has historically (recession and onwards) added 75-100k jobs a year. So this really is just a blip. Much like many others, I'm sure, I'm done freaking out about Amazon. The subway capacity is there to absorb the new riders, the land in LIC is undeveloped, and in the long term, the company will help anchor the NYC tech industry -- which will only serve us well as we fall further in love with our computers. The real thorns in this? The lack of public engagement, and the fact that we have to pay $120,000 per job created. After all the strum und drang, Amazon settled on the two least creative locations, which suggests that the picks were predetermined. Us taxpayers have been taken for a ride. I think my concern about overcrowded subways in Queens, especially the and lines is a bit more than just getting “all worked up over Amazon.” I only take the on a regular basis to/from work during morning and/or evening rush hours. You’re right that we don’t know exactly where the new Amazon employees will choose to live. It could be in LIC itself, where they’d be able to walk (or bike) to work. It could be the well-known hipster Mecca known as Williamsburg, along with Greenpoint and Bushwick. Perhaps that might mean full-length trains would be here to stay after the tunnel work is finished (certainly a good thing). It could be Maspeth, LIC’s next-door neighborhood to the east or the other areas along the Lower Montauk Branch, in which case, they should really give serious consideration to running some kind of passenger rail service between Jamaica and LIC on that branch. On the other hand, they certainly could choose neighborhoods like Forest Hills, Rego Park, Sunnyside, Woodside or Jackson Heights, all of which are on the already well-used and lines. If MTA management can’t (or refuses to) figure out how to make the most of the extant capacity on those lines, then I’d be very concerned. This focus on new populations is just obfuscating deeper mismanagement of the city, to the benefit of those who are in charge of the rot. I mean, if they can actually increase throughput on all or most of those lines now, without even needing to install CBTC, then great! Please do. They probably should have ages ago. It’s not like the subways in Queens just started getting overcrowded. They’ve been that way for decades. But that would require MTA management to break a decades-old tradition of ineptitude/complacency. I think it’s possible. But they have to want to break it. Fair points about how we won’t “suddenly” have 25,000 more people crowding the subway in Queens and that there is spare capacity on our existing subways if MTA management dared to look for it. The one thing I would do is depending on exactly where Amazon will be would be to build a new connection for the to the Astoria line with a portal that comes out not too far past Court Square, going to a new, above-ground platform at Queens Plaza (with transfers to the other lines there and OOS transfers between there and Queensboro Plaza) before joining the Astoria line and going to DItmars. I'll give you a extension to QBP and/or 21st...but up the Astoria Line? This is almost a caricature of reverse branching. Up the Astoria line might be easier. 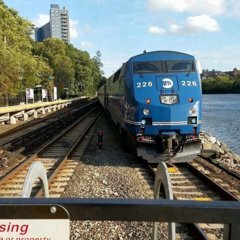 Also would potentially make it more politically viable to extend the Astoria line to LGA like so many want if it also benefits those in Brooklyn OR as I would do with the Astoria Line, extend it into The Bronx, potentially to Jacobi Medical Center with transfers to the at East 180 and at Westchester-Elder Avenue. Ah yes, politics... Astoria riders really want that one seat ride -- they're even willing to give up more Manhattan service for it! I've never really understood the obsession people have with Bronx-Queens routes. The Lex/ combo already does a decent job in that market -- really you'd be saving people all of a few minutes. IMHO better to send to LGA and then east to Flushing. The issue is between Central/Eastern Queens and the Bronx. It would be great to speed up the Q44 more, and it would be amazing if some way were found to have LRT over the Whitestone. This I could get behind. I'd love to see a line follow 678 from Jamaica up to 95, and then that over to Manhattan...but that ain't happening while I'm alive! I think the only way the would ever run to Astoria (the neighborhood) is under its own line separate from the actual Astoria line. Of course, I don't know what purpose it would serve since its design limits its use and popularity. Yup. I think sending the to QBP or to 21st should be made more of a priority than it is today, what with LIC building up, non-conventional commutes becoming more popular, and deinterlining looking more likely. Beyond that, though, I don't see much reason to continue -- unless, of course, you send it across the river as a crosstown route in Manhattan, completing a just-outside-the-core orbital route. No, you keep the underground and you build a new platform at Queensboro Plaza and you offer in-system transfers to the Queensboro Plaza trains AND the ones at Queens Plaza. And you DON’T send the to Ditmars! Wrong! By reverse branching the Astoria el, you actually might be making be making it less viable, both practically and politically. No one’s going to be excited about the taking away capacity from the Astoria el that could otherwise be used to run more Manhattan-bound service and ease some of the existing crowding on that line. Connecting the underground to the elevated Astoria el in very busy Long Island City is a very bad idea! As for extending the Astoria line to LGA, politics and NIMBY's have the last word on that matter, and they've made up their mind regarding such an extension for a while now IIRC. I'd eat a hat if Robert Moses designed a bridge that could handle trains. In an alternate world where the MTA built subway lines at regular costs, or maybe even the ridiculously low costs of the Spaniards, you might as well forgo 678 entirely. That would actually be for the better; 678 is next to a whole lotta nothing, with compelling neighbors like a cemetery, a Trump golf course, Malba, and the NY Times printers. I'd much rather serve actual people, and build a line under Kissena or Main, head under College Point Blvd, then WPR until Parkchester , and mosey on over to E 180 St .